Lakayla Eberhardt and teacher, Carolyn Khouri at Lincoln West School of Global Studies. Lakayla Eberhardt was not impressed when she learned that students at Lincoln West School of Global Studies had to wear red. “I was like, ‘The whole school is red? I thought in high school you could wear whatever you wanted,’” she remembered. Lakayla was further disinterested when she learned that Lincoln West maintained a year-round academic schedule of 10-week terms followed by three-week breaks. “That sounded like I wouldn’t have a life outside school,” she said. Still, Lincoln West’s global studies angle compelled her. She liked that students could take school-led trips to countries such as China and Costa Rica, and that students learned about cultures from around the world. Plus, it was close to her house on Cleveland’s near west side. It was enough to make her list Lincoln West as her third-choice high school. However, Lakayla considered Lincoln West a very distant third, behind two other high schools where most of her friends were going. But when her top two choices fell off the table—one school was too far, and the other was full—Lakayla found herself becoming a reluctant wearer of red. During her 9th grade year, she perceived the other students as rude and unfriendly—though in retrospect she believes they were only responding to her own standoffishness. She also felt intimidated by the fact that some students could speak multiple languages. Her days were long, unhappy slogs. She sat in the back of all her classes and rarely spoke. The only saving grace was an unexpected one: the year-round calendar. She found the sporadic three-week breaks rejuvenating. Finally, in art class, she met a student who knew some of her dad’s family. Through him, she met a few others, including a student who ate lunch in the classroom of one of the school’s English teachers. Intrigued, Lakayla tagged along. 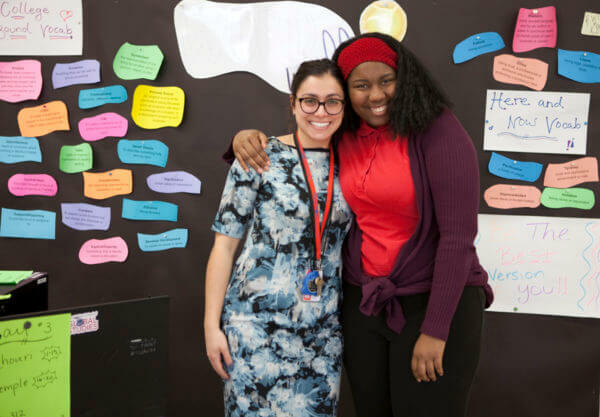 Teacher, Carolyn Khouri, remembers Lakayla as exceedingly shy at first. Lakayla credits the intimate, low-pressure environment with helping her find the confidence to speak in other settings. “Ms. Khouri was talkative herself, and I think that helped me talk more, too,” she said. 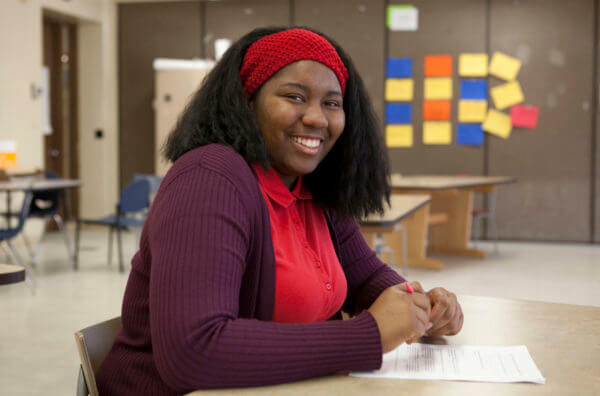 Now in 11th grade, Lakayla revels in the school’s global approach to education. She’s not sure of her post-graduation plans, but is considering studying medicine in college, perhaps after working first as an emergency dispatcher. She can’t picture herself at another high school. It’s been a lesson, she said, in staying open-minded even when first choices don’t work out. As for wearing the dreaded red? She smiled. “It’s actually my favorite color,” she said.